The Victorian Government has announced it is seeking public feedback on a proposed ICT strategy, Digital by design developed by the Victorian Information and Communications Advisory Committee (VICTAC). The draft provides advice on the future management and use of ICT by government and how the Victorian Government can design and use information and technology to deliver better services. The public consultation is for just over two weeks, finishing on 17 October. 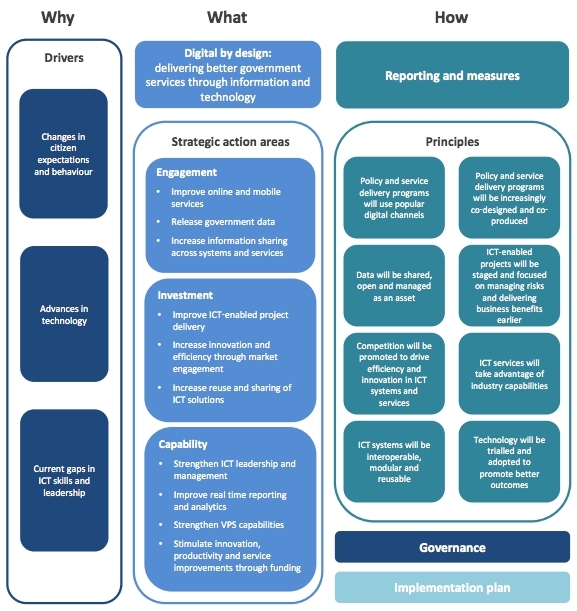 The strategy sets out objectives and actions focused in three key areas and proposes eight principles to guide ICT decision making (per the chart below). While not focused on Government 2.0, the draft strategy takes into account the increasing digitalisation of communications, expectations of citizens and the need to increasingly co-design and co-produce policy and service deliver programs and to design code for reuse, as well as the need to embed innovation within ICT and release more public data. The Brotherhood of St Laurence welcomes the digital by design – Victorian Government ICT Strategy 2012 public consultation on the Victorian Government’s proposed strategy to “make information and online services easier to find and use” and to provide “more personalised and integrated services” through permission for the sharing of personal information and data. There are still significant groups in the community who do not have access to these essential facilities or capabilities. This includes people with disabilities, members of the CALD community, people who are socially or financially disadvantaged, rural residents and older Australians. With the proposed shift to increasing service delivery online, the government has a reciprocal obligation to provide the means for all segments of the community to access these new online services, by ensuring information is easy to access and understand, internet access is universal and appropriate opportunities for skills acquisition are provided. While reference has also been made in the strategy to the increased use of smart phones for internet access and the delivery of government services, the rapid increase in the use of tablet devices should also be included in these delivery plans. The design of online services needs to ensure that they are fully accessible and functional on these devices.